Offering a competitive compensation package is certainly a crucial component of effective recruiting, but the first step is to identify the best practices and most effective approaches to finding and attracting top architecture and engineering talent. And, with so many recruiting outlets available, it is important the identify the best, and not waste time and money on those that are just not that useful. In 2017, PSMJ's A/E Recruiting Study: How Today’s Most Successful Firms Find and Recruit Talentreported on what we learned about how firms find and recruit talent and how effective each outlet is. This year, we conducted the 2019 A/E Recruiting Survey for A/E/C RecruitMax, with the aim of determining if and how recruiting trends have changed compared to those reported in 2017. How have recruiting trends changed in 2019? In these surveys, we asked a range of questions relating to how firms most frequently find and recruit talent, and then overlayed that data against what recruiting practices respondents believe are the most effective. Here, we have compared this year’s results with 2017 data and results from a similar recruiting study done in 2013. 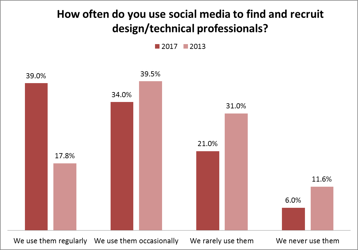 While regular use of social media to find and recruit design/technical professionals more than doubled from nearly 18 percent in 2013 to 39 percent in 2017, A/E firm use of LinkedIn, Twitter, etc. 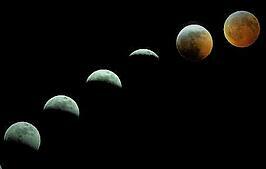 on a regular basis has increased only slightly in the past two years. 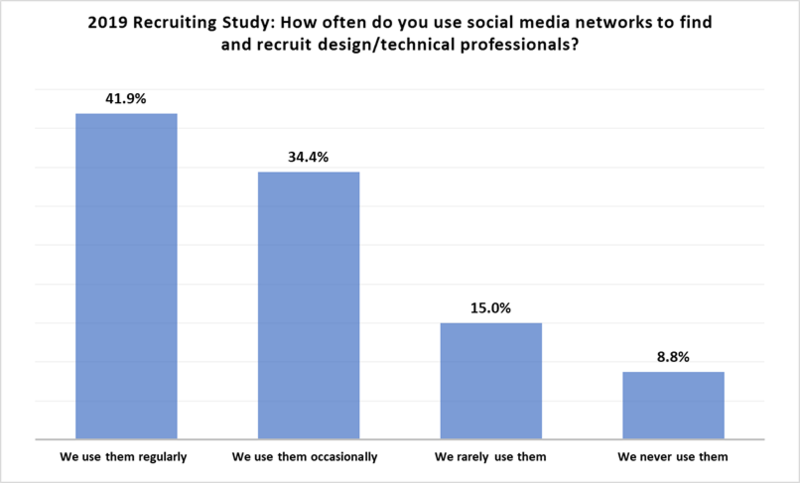 The 2019 study finds that 42 percent now use social media networks regularly to find and recruit design/technical professionals. 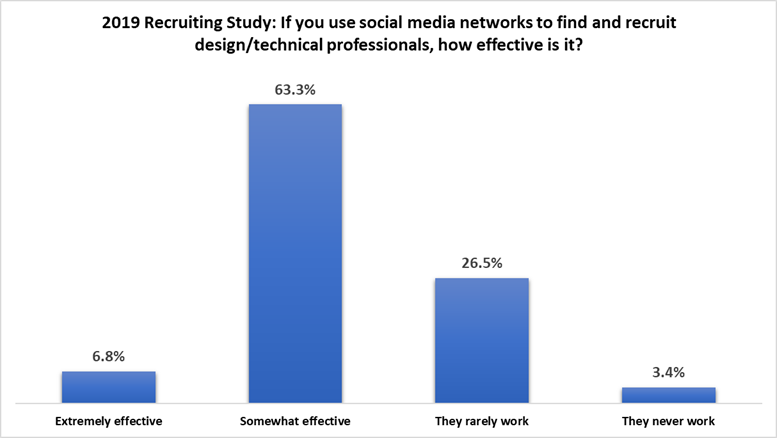 And then, both the 2019 and 2017 recruiting studies found that 34 percent of firms occasionally use LinkedIn, Twitter, etc. to recruit design/technical professionals. In 2013, close to 40 percent said the occasionally use it. 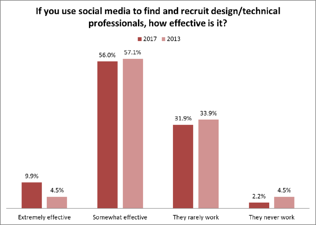 Meanwhile, we found some changes over the past two years in how firms perceive the effectiveness of social media to find and recruit talent. In 2019, close to two-thirds (63.3%) of survey respondents said social media networks are somewhat effective, while only 6.8% said they were extremely effective. And then, more than 26.5 percent said that social media networks rarely work, and only 3.4 percent said they never work. In 2017 and 2013, fewer respondents, 56 percent and 57.1 percent respectively, found that social media to be somewhat effective. Meanwhile more firms (9.8 percent) in 2017 and fewer (4.5%) in 2013 said that social media was extremely effective. And then in both 2017 and 2013, close to one-third found that it rarely works. And finally, fewer firms (2.2 percent) in 2017 and more firm (4.5%) in 2013 said that social media never works. Want to learn more about the latest A/E recruiting trends and how they impact firms like yours? A comprehensive analysis of recruiting best practices based on the results of this study will be presented at A/E/C RecruitMAX 2019 to be held on July 23-24, 2019 in Seattle. This conference is specifically designed to address issues faced by senior HR leaders and other key executives in the A/E/C industry. The surest way to firm success? Find and hire the best! At A/E/C RecruitMAX 2019, you'll learn how to compete for top design and engineering talent using new strategies, technologies, and processes. It's the essential learning and networking event for firm leaders seeking maximum return on recruiting investment. Join your colleagues and leading recruiting experts for this intensive immersion in sourcing, identifying, attracting, and landing the most important new contributors your A/E/C firm will ever hire.